Admittedly, Pop-Tarts are a young person's game. Their colorful icing schemes and high-fructose filling scream school bus, not morning commute. It's not because they aren't delicious, they just give off a "hey-my-fingers-are-sticky-and-I-can't-grow-facial-hair" vibe. 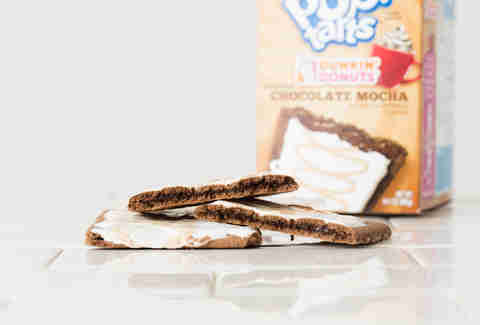 But perhaps these two new latte-flavored Pop-Tarts will change that. 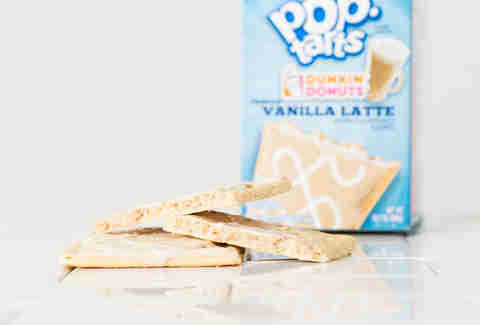 According to a press release, Dunkin' Donuts -- everyone's favorite New England-based coffee chain -- has joined forces with the popular toaster pastry maker to bring breakfast snacking into adulthood. Because nothing says "I'm a grown-up" like coffee-flavored toaster fodder. First up is the Vanilla Latte flavor -- which features a creamy vanilla filling and coffee icing, complete with the ubiquitous latte swirl (sans judgy barista). This sucker tastes more like a Brown Sugar Cinnamon/S'more Pop-Tart mix than an actual DD vanilla latte. But maybe that's for the best. The second flavor, Chocolate Mocha Latte, is a little more intense: It has a double-espresso filling and a cream-flavored icing base with a swirl of coffee flavor on top. It's super-chocolaty. Like Augustus Gloop-falling-into-a-river-of-chocolate chocolaty. Again, this is not a bad thing. You can see for yourself, as this December the (limited time only!) 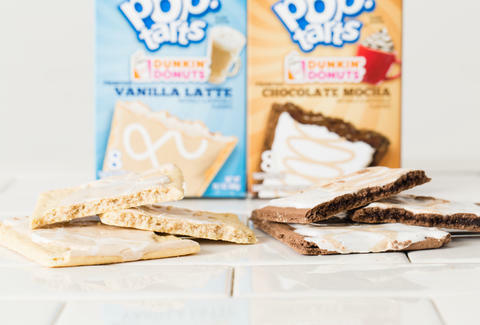 the Dunkin' Donuts Pop-Tarts will be available everywhere you normally pick up Pop-Tarts. Which -- unless you have an underground Pop-Tart dealer like I do -- probably means your local supermarket. Good luck. And don't be ashamed if you love them.